Goodbye winter clothes, hello warm weather. If you’ve got spring fever and want to pick up a few new fashionable pieces at prices that won’t break the bank, I have some ideas for you. Check out these cute spring outfits for plus size gals that will bring sunshine to your wardrobe! Blue + white is always a popular color mix beginning this time of year. This season you will see a much wider range of blues than usual from subtle to saturated. This dusky blue-gray top with the dreamy white florals and pretty pin dots makes me think of clouds in a hazy summer sky. Wear this boho-inspired peasant top with a cute pair of white capris, some strappy block heeled sandals and this gorgeous blue bag, and enjoy the compliments that come rolling in! There’s no better color to make your skin glow than a soft, summery peach. This cute pastel tee with the feminine elbow tie sleeves is just what you need to perk up a pair of your favorite jeans or jeggings. 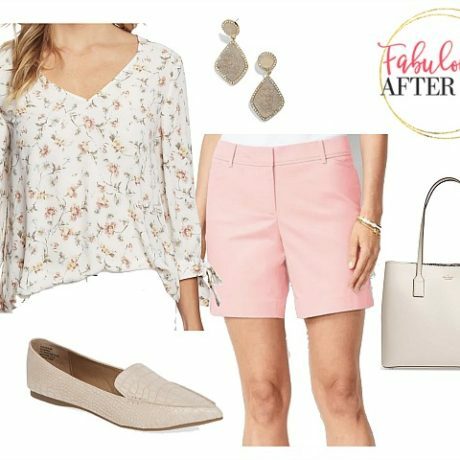 Add a cute crossbody saddle bag, gold lace earrings, and a pair of fab brown suede mules, and you have a relaxed spring look that is sweet and slimming. Picnic anyone? This darling gingham top with the elastic neckline and feminine flare sleeves looks perky and modern worn with a sporty pair of skinny black jeans. Keep the color scheme boldly black and white by adding a pair of flat medallion slip-on sandals and a striking black bag. Silver drop earrings light up this outfit creating a very pulled together casual spring and summer outfit. Added bonus>>>The top coverts to an off the shoulder blouse when you pull down the elastic neckline! Previous Post: « Sporty Spring Shoes That Score Big!